This book collects, for the first time, all eleven Dorus Noel stories from 1933-1934 in the pages of All Detective Magazine. Each story includes the original opening illustration. In addition to the stories the first two pieces (see contents) are very informative about Burks and All Detective Magazine. Dorus Noel spent many years in the Far East, and knew it’s people, languages and traditions well. Now he is living in New York’s Chinatown, an undercover agent answering to his mysterious boss on Park Avenue. 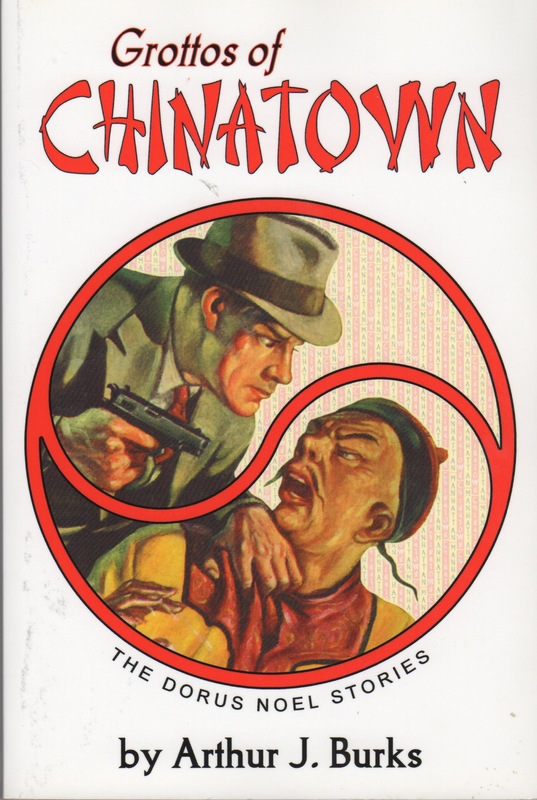 Here he attempts to solve the insidious crimes of the mostly hidden Chinese underworld, a place of strange alliances, dark menace and mystery. Here is an urban nightmare of hidden rooms and secret passageways riddling the district like a rabbit warren, a world in shadow, of fantastic wealth, lush carpets and draperies hiding cruelty and evil, beauty and ugliness. Dorus Noel knows this place, he goes into it with a soft step and a loaded gun, and he solves the most bizarre cases, the ones beyond the ability of the regular police. These stories are good fun, very atmospheric, not particularly puzzling but entertaining nevertheless. There is a sameness about the stories that made me want to read only one or two at a time, so I took my time finishing this one. A very nice collection, and an enjoyable one. This entry was posted in Books & Reading, Friday Forgotten Books, Mystery. Bookmark the permalink. I’m a fan of Fu Manchu stories so GROTTOS OF CHINATOWN sounds like a winner to me! Nice review! Great cover. I don’t know this one at all but I like the look of it. I was wondering (rightly, it turns out) about the name. According to Amazon, it is Dorus Noel. As it shows on the cover. I believe autocorrect changed it in all instances and I didn’t catch it when I proofed. Thanks. I deleted your other correction when I edited the post and this one. I will definitely put it on my list, but that is growing huger by the minute. I need to get reading instead of adding more books to my “wants” list. Looks like autocorrect also switched Banks for Burks. I’ve enjoyed most of his stories that I’ve read. He began as Brigadier-General Smedley Butler’s aide and spent much of his latter career writing self-help and nonfiction books. The stuff he wrote in the middle, however, is interesting. No, those two are on me, but I’ve now corrected them. Funny how you can proof something you wrote and just not see these things. Thanks. I have a copy of this and hope to read it soon. That introductory material really is interesting. I enjoyed this book, but a lot of Burks’ work is standard pulpsmith stuff. He always seemed to find work. Agree, but I found these to be different from my usual fare and entertaining. This sounds like a good collection. I don’t always enjoy short stories of this vintage, but I would like to give these a try.